Bangalore's Biggest Holi Festival last year we colored more than 5000 last year. 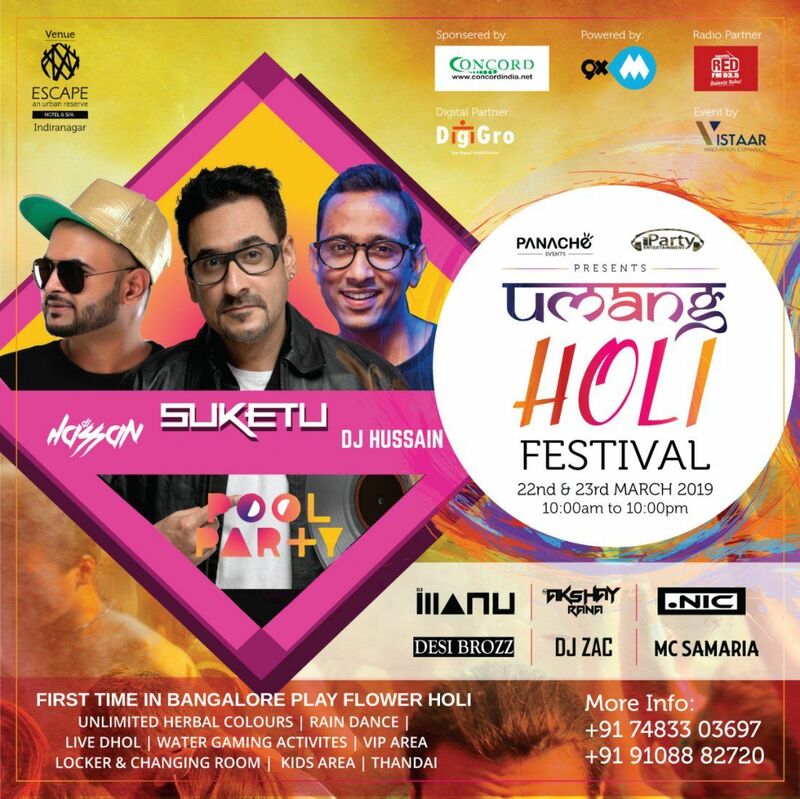 Umang Holi Festival 2k19 Biggest Holi festival at Bangalore city happening in Escape Hotel, 100ft indranagar next to The Black rabbit. Play holi with flower for those who dont like colors but want tto play holi, separate area for flower holi . With your tickets so much and do many things you getting Bangalore's Biggest Holi festival since last 8 years known for Holi festival in Bangalore city in Escape Hotel , 100ft rd Indranagar next to The Black Rabbit . Bangalore Most Popular Artist of Bangalore for Bollywood, Deejaying from past 20 years played in all Big festivals and Popular Artist . Dj Hussain Is playing on 22nd of march . -10 big celebrity Dj's from India Music/Bollywood/Edm/Hip-hop/Punjabi/Trap/Dbn/psytrance. - Compulsory 500/- Coupon has to purchase at the venue for F & B per person. Note :- Entry Pass include only Colors, mobile Cover.